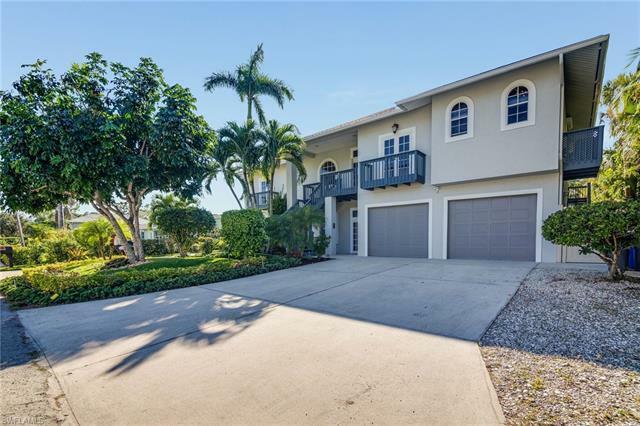 Beautiful Gulf Access Pool Home features upstairs living area with 4 bedrooms with 2.5 baths totaling almost 2800 sf. Additional first-floor living space of 2500+ SF boasting 2 bedrooms and 2.5 baths with great room and kitchen area. Total living space is approx 5400sf! Plus a 3 car garage. All with NO HOA. Superbly decorated and updated by a professional decorator. New roof 2018. New pool 2017. Newer AC (3), Newer appliances and water heaters (2), electric storm shutters, Fenced yard with new dock area, mature fruit trees, lush large yard, all within less than an 8-minute drive to the Beach! Boat, kayak, and fish with direct Imperial River access to Estero Bay and the Gulf of Mexico. Paradise found with magical sunsets and early morning coffee enjoying Gulf breezes overlooking the canal. Built for the discerning buyer who wishes to own a truly majestic home updated from the inside out. Perfect for the large family, could serve as the family meeting place for a winter getaway, great for the buyer looking for a mother in law living space with privacy. Incredible opportunity to have an Airbnb. The possibilities are endless. Schedule your private showing today!